Demo reel from the Japan Computer Graphics Lab circa 1984. Quite a few flying logos, along with segments from the Lensman animated movie. Third demo reel from the Japan Computer Graphics Lab circa 1985. A retrospective of the work of Robert Abel and Associates, a pioneering commercial computer graphics company that created some of the most iconic early computer-generated imagery. Included here are over 40 commercial spots, ranging from 30-second commercials and commercial logos, to their 1984 animated short "High Fidelity".To put Abel and Associate's work in perspective: By the time Pixar's first short "André and Wally B." debuted in 1984, Abel's company had been producing computer animation for 13 years. Unfortunately, Abel & Associates closed in 1987 following an ill-fated merger with now-defunct Omnibus Computer Graphics, Inc. For more information, consult: https:en.wikipedia.orgwikiRobert_Abel_and_AssociatesSource: "Visual Pioneers" series Laserdisc. Vhs machine 80s inspired montage. Visual playlist. BEHOLD the AWESOME POWER of the Silicon Graphics IRIS 2400 workstation. Able to animate DOZENS of flat-shaded polygons at SEVERAL frames per second! Long before SGI's Jurassic Park heyday, their early IRIS 2400 system cost more than a nice condo and came equipped with a 68010 CPU running at a blazing TEN megahertz! This is the version of "The Mind's Eye" that was sold in Radio Shack stores in the early 1990s. It was never released on DVD. This version is different from the official Miramar release in that it's slightly older, has different animation on a lot of the tracks, and includes three different videos at the end.1. Creation 2. Civilization Rising 3. Heart of the Machine 4. Technodance 5. Post Modern 6. Love Found 7. Leaving the Bonds of Earth 8. Q Factor 9. Tingri 10. The Way I FeelSorry that the quality isn't better; I had to make this from a copy of my original VHS, which has since deteriorated to the point where it won't play. Early (1983) demo reel of Pacific Data Images. Mostly plasticky flying logos at this early stage, today the company is best known for creating the "Shrek" and "Madagascar" feature films. 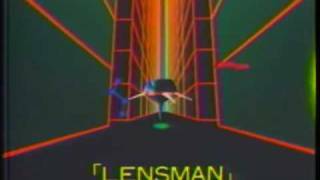 Computer animated short from 1985 featured gratuitous amounts of ray tracing, rendered on a network of 108 Apollo Workstations. Early demo reel (1983) of the Japan Computer Graphics Lab, Inc. The audio has been muted by YouTube as it apparently matches some WMG content. Sorry about that, just hum the Blade Runner theme while watching this.